Mako Vunipola admits his scrummaging must improve after a troubled few months as England look to retain their Six Nations title. "I don't think the criticism has been unfair," the Saracens loosehead prop Vunipola told BBC Sport. "I've had to take a look at myself in the last couple of weeks and go back to the drawing board." Vunipola is England's sole available experienced loosehead, with Joe Marler suspended and Ellis Genge and Matt Mullan struggling with injury. In an injury-hit squad, he is perhaps the one player Jones can least afford to lose, his ball-carrying skills at even more of a premium because of the absence of his younger brother Billy with a broken arm. 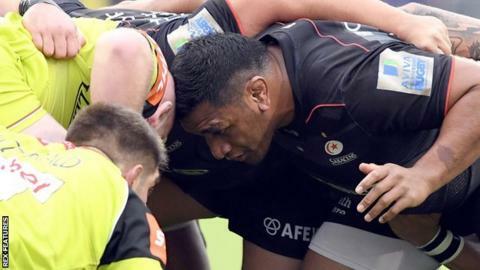 The Saracens pack struggled against Ospreys in the European Champions Cup earlier this month, shipping six scrum penalties, their traditional set-piece strength under pressure in a testing season for the double European champions. "A few games have gone away a bit from what we were trying to work on as a team, and scrums are becoming an even tougher battle now," Vunipola added. "I've done more one-on-one stuff with [coaches] Ian Peel at Saracens, and Neal Hatley with England. "Neal is constantly messaging me and coming down to the club. Little things, where you feel you're doing one thing right, but there are other small things you could be doing better. You're always constantly monitoring, whether that's training or games. "It's part of the process of not being able to rest on your laurels - laws have changed, players are getting smarter, and teams are trying things you wouldn't expect. That criticism helps us get better." Vunipola, an integral part of the Lions front row in New Zealand last summer, is looking forward to packing down again with his England team-mate and captain Dylan Hartley. "A massive part of the game as a front row is cohesion, but that can only come from having played and trained together for a long time. The more you do together, the better you get at it," he said. "We've talked about improvement. We set a goal in the autumn to get better as a team - game on game, week on week, we have to constantly improve."